Luxury holiday beach villa with its private pool alongside the terrace, nestled in a private tropical flower and coconut tree garden of the Coconut Laguna Villas, on the second row at 20 meters from the beautiful Bang Por palm fringed and white sand beach, and at 20 meters from the resort crystal clear water swimming pool with basin for children and a whirlpool...and if this is too far you can instead relax on the private swimming pool alongside the villa terrace. Built to high western standards with a Thai design influence, this holiday villa is a spacious accommodation for 6 guests in three (3) spacious queen bedrooms each fitted with satellite 42” TV, DVD and en-suite bathrooms, a comfortable living room area with satellite 52” TV and surround sound system, a fully equipped western granite open plan kitchen. The covered outdoor living area is equipped with large table, and sofas for eating 'al fresco' and relaxation. On the upper terrace, you will enjoy sunbaths and stunning sunset view. 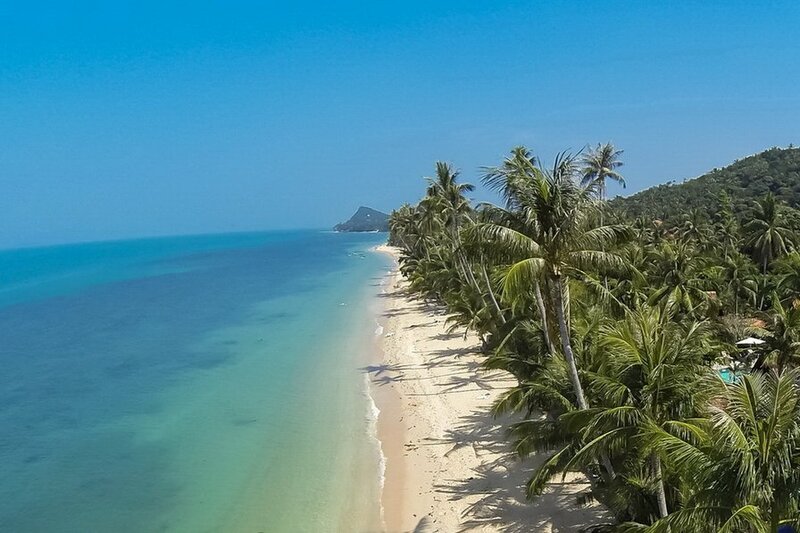 The Coconut Laguna Villas is a privately owned beachfront resort composed of 11 villas only. It is a unique location in a coconut environment, plants and flower environment, alongside the sandy Bang Por Beach (3.5 km). There is no road to cross; the beach access is through our garden alley. This is a very safe place for the children as well. Bang Por beach is calm, quiet and clean. This area is very relaxing and at the same time near from all attractions. There are quite a few Western and Thai restaurants along the beach within 500 meters on the left or right, and few restaurants on the road leading to the Coconut Laguna, including a famous seafood restaurant at just 300 meters. The nearest beachfront restaurant is situated at only 50 meters from the villa. You can also order food from the restaurant just outside the Coconut Laguna which is delicious and really cheap. There is a convenient store opened 24/24 at 100 meters, a gym at 50 meters, Muay Thai Boxing at 150 meters, a supermarket at 4.5 km, few shopping malls and hyper markets are at 15 minutes by car. The famous Fisherman's Village (restaurants, shopping) is at 10 minutes, and Chaweng (very busy night life) is at 20 minutes. Our cleaning and maintenance team is dedicated to your comfort during your stay. You can meet or call our really nice and friendly Housekeeping Manager at any time and if you wish, she would even facilitate your stay booking taxi, car rental, baby-sitting, part time cook, etc without you moving from the villa. All external services that she will arrange for you are at local rates and without commission from our side. There is nothing to pay to us. If you wish, we can also arrange the airport pick-up, you just have to pay to the driver when you arrive at the villa. Our rental rate is all inclusive of: Taxes, electrical (500KwH per week for free), water, local telephone, international TV Sat and DVD player in all rooms, free unlimited Wi-Fi, full house cleaning twice a week with bed linens and bath/beach towels replacement, cleaning after departure, sunbeds at the pool and on the beach, kayaks available for free. The site is under surveillance with CCTV and night watcher, and the garden and pool are maintained every day.